Chickadees and warblers call from the tops of the pines that line the shore, and seagulls caw and splash as light departs the day in the Puget Sound. It’s after 9 o’clock in the evening on Saturday, and only now are anchor lights beginning to gleam. All of the visiting boats in the bay appear to stand at attention, all facing the direction of the gentle, northeasterly breeze. There are about 10 of us here. Named after an American hero who survived the war of 1812, Port Ludlow is perhaps a fitting place to spend Memorial weekend. Okay, so this entry isn’t exactly the home improvement post I promised…next time, perhaps? Instead, a weekend getaway it is! We rushed from work on Friday evening and untied the dock lines as quickly as we could. The moment the lines were coiled and our aged fenders stowed, I felt free. We traveled as far as Port Madison, a protected inlet on the northern tip of Bainbridge Island, and raised our new mainsail for the very first time (more on that soon…) Excitedly, we worked together to adjust the sail, and The Red Thread’s most important source of power filled in the light wind. We glided into Port Madison at dusk, secured our anchor in the muddy bottom, and fired up the grill. Our weekend getaway had begun! Saturday morning was gray, but Mother Nature was kind and the rains did not come. Port Madison is beautiful. Large houses stack upwards from the edge of the water, the shores are adorned with private docks, and well-kempt sailboats with colorful hulls bob peacefully on mooring buoys. Canada geese glided one after the other across the water, and a pair of bald eagles held watch from a timeworn pylon. I found a comfortable seat atop the cabin and fiddled with the new camera, an recent investment we made for documenting our upcoming voyage. We weighed anchor and departed in the early afternoon. After a stop in Kingston to pump out our holding tanks (an aromatic point in our weekend for all of the wrong reasons), we made our way toward Port Ludlow. The winds were not ideal, but we had given ourselves ample time to enjoy our new main and to unfurl our new jib sail for the first time. Yes, two new sails = BIG DEAL! Having a full set of new sails was arguably the most critical upgrade we made in preparation for a year of relying on the wind. 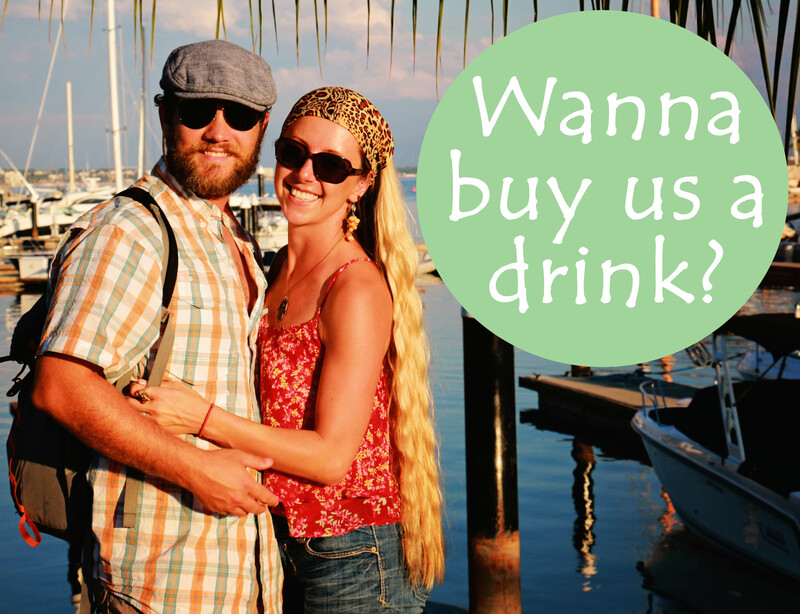 One of the things that Neil and I are guilty of is trying to cram too much into our sailing getaways. Our eyes tend to be bigger than our stomachs, and we wind up spending more time on the move, rushing to get to the next destination than enjoying and exploring the places we reach. We’re trying to change that and agreed that Port Ludlow would be our only stop, with the exception of our Port Madison overnight en route. That said, we made relaxing our sole task, which is rare for us these days! 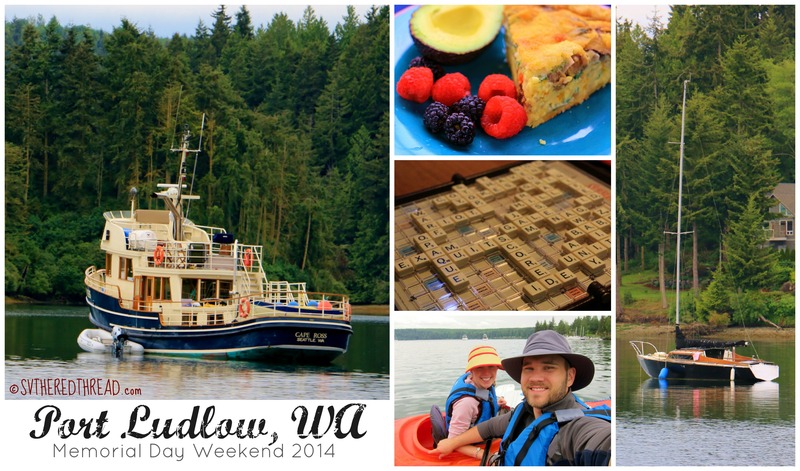 This was our second time in Port Ludlow. Our first was May 27, 2012. We docked here during the second day of our 3-day maiden voyage when we brought The Red Thread from Anacortes, Washington to Seattle. The emotions that accompanied today’s arrival differed markedly from those of our journey just two years ago. Getting ready to dock our new boat for the second time ever, we were timid and giddy then. Today, we planned to anchor, a skill we had not yet established two Mays ago. Butterflies of excitement and uncertainty captured most of my memory during our previous visit. I was excited and nervous during our prior arrival. This time I saw Port Ludlow with my eyes, not just my emotions. I took note of the colorful resort buildings that line the entrance to the inlet and was more attentive to details about the area that had gone unnoticed before, including two small islets that guard the entrance to a shallow, secluded anchorage. Saturday evening gave way to a serene night. S unday morning, we lounged. I baked a quiche, we enjoyed breakfast, and then we lounged some more. Awesome. Eventually, we launched the kayaks and explored the Twin Islands before making our way back toward The Red Thread, which was anchored happily a few hundred yards from the Port Ludlow Marina. Later, our friends on s/v Namaste dinghied over for a visit. 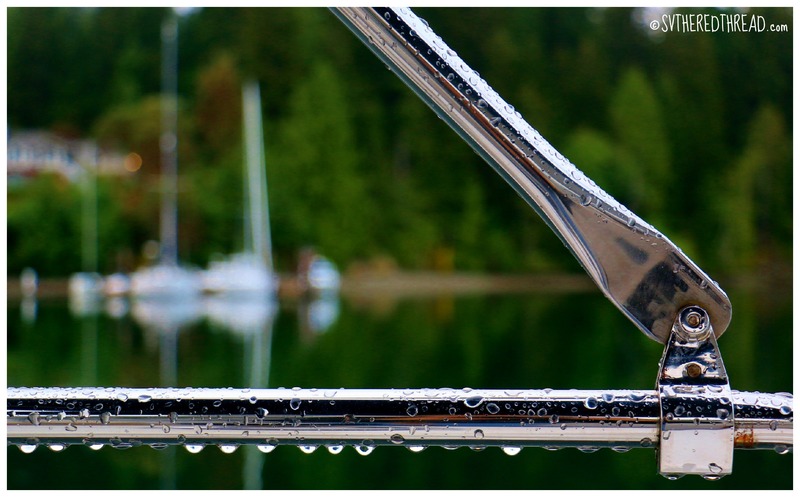 I had connected with Cindy thru Women Who Sail, a Facebook group, a stellar resource for women whose passion for sailing is at any stage (e.g., dreaming, scheming, cruising). We connected at the Seattle Boat Show in February and have kept in touch about our voyage planning. Namaste’s family of three resides in Port Ludlow for now, but like us, they will soon be setting sail south and calling the ocean home. We experienced a great deal of comfort in sharing the stresses and preparations of getting ready to cruise with our new friends, especially since we like them so much! I anticipate that our friendship will continue to grow as our paths cross down the coast. Sunday evening, I was the comeback kid at scrabble and managed to steal Neil’s would-be victory with triple points on the word “exam.” Neil has a damn good vocabulary, and it was fun to compete with him (and beat him). I offered him cookies as a consolation prize. Sunday morning, we roused early, kayaked to shore, and went for a run (yes, me included…if you know me, you know I really only run if being chased). Afterwards, we hiked the short trail to Port Ludlow Falls. An excellent start to our final day, the best was yet to come. After departing the inlet at 1 o’clock, we hoisted the sails and enjoyed a spectacular sail home. Rarely are we so fortunate to experience consistent winds from the desired direction in Admiralty Inlet, but on Memorial Day, we had 11 to 16 knots of winds from the north, enabling us to ride the winds on a broad reach for a solid five hours. The sun was out and the sails proud and full. Even the tides were in our favor. We dropped the sails just before entering Elliott Bay Marina. Weekends like this one are why we love this life…hopefully a taste of what is to come in the year ahead. This entry was posted in Boat Life, By Jessie, Holidays, Pacific Northwest, Sailing and tagged Broad reach, Kayaking, Memorial Day, Port Ludlow WA, Port Madison on Bainbridge Island WA, Quiche. Bookmark the permalink. So fun! Your adventures are priceless! JJ and I just shot a wedding at Port Ludlow and LOVED it! Glad to hear your new sails are working well; love the pictures, clear sky with sails unfurled!